My dishes are meant to be used and enjoyed; slip decorated press-moulded earthenware is an approachable and friendly medium. The designs reflect my view of life, celebrating friendship and the sharing of simple pleasures. Some dishes have inscriptions, which are not separate from the designs but integral to the whole both in form and meaning. The overall design echoes the sense of the words (as a tune echoes the sense of the lyric). The lettering is done freehand, fairly fast. I trained as a painter, and spent twenty years dealing in eighteenth and nineteenth century drawings before deciding to go back to making things. After a three year ceramics course I set up my present studio with Regina Heinz, in 1996. 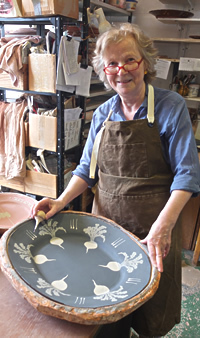 I am a member of the Craft Potters Association and the Art Workers Guild.